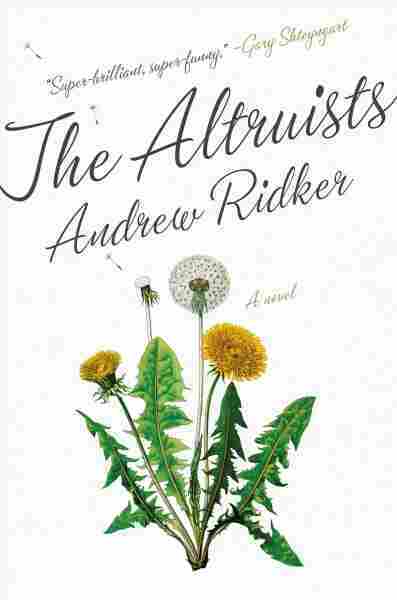 Book Review: 'The Altruists,' By Andrew Ridker Andrew Ridker's sharp, compassionate first novel follows a family of flawed but sympathetic bumblers whose efforts to do good more often end up causing harm — to themselves and others. Andrew Ridker, still in his twenties, has uncorked a lively, tragicomic debut novel, a probe into questions that never get old: What constitutes a good, moral life, and how do you pull it off in this world? Many first novels fall into one of two categories: the campus novel, or the dysfunctional family novel. The Altruists combines the two, but don't let that put you off. Ridker elevates his book with a sharp eye for the absurdities of contemporary American culture and his characters' irksome pieties, though his ironic sensibility is offset with a good measure of compassion. The patriarch, Arthur, is a disillusioned engineer who somewhat desperately and selfishly moved his wife and two children from Boston to St. Louis in pursuit of a chimerical professorship at Danforth University (a stand-in for Washington University in St. Louis, of which it's actually a part). Adaptable Francine held her family together and built a successful practice as a couples therapist, but tenure eluded Arthur. Twenty years after the move, Arthur is a bitter, 65-year-old adjunct — and a widower. He's also a cheapskate who justifies his stinginess with convenient moral arguments. Amidst growing financial struggles two years after his wife's death, he belatedly realizes that "He'd had it both ways for nearly two decades, railing against a culture of commodities while partaking in the comforts with which Francine had insulated his family." The novel traces the source of each Alter's pain, flipping between the past and present. There are some very funny scenes, including the wonderful, tone-setting opener, a flashback to a house fire 15 years ago that sent the whole family out to the front walk. Francine emerges from her home office with a couple wearing animal masks, new clients who had sought reassurance that their "little midlife kink," a predilection for dressing as household pets, was normal. She worries what the neighbors will think, but her more pressing concern is to prevent Arthur from running back into the burning house. (We later learn what he wanted to rescue.) "What would this man do without me?" Francine thinks. We eventually learn the answer to that, too. Ethan and Maggie both fled to New York after their mother's death. Did their windfall make them happy? No. This family is not wired for happiness — at least, not yet. Ethan, a gay introvert who's still scarred by a college affair which ended badly, has hit one of life's dead ends. Maggie, two years out of Danforth, alienates everyone with her unyielding moral superiority: "I'd rather die than live a superfluous life," she declares. Hers is a harsh, punishing ethic of self-denial that involves thankless miserable jobs and insufficient food. Ridker elevates his book with a sharp eye for the absurdities of contemporary American culture and his characters' irksome pieties, though his ironic sensibility is offset with a good measure of compassion. Set-up in place, the narrative builds to a showdown between needy father and his estranged grown children. Arthur's ham-handed idea of winning over his sensitive son involves taking him to a ballet — despite Ethan's lack of interest in dance. But Ethan is touched, noting it's better than their disastrous outing to a baseball game when he was ten. It'll take more than that to soften Maggie, though, who feels that "fatherhood was a creepy, ill-fitting look on Arthur, like a cape or a Speedo." Ridker's skillful balancing act between sympathy and satire is on full, fabulous display in an I'm-mad-as-hell-and-I'm-not-going-to-take-it-anymore moment, when Arthur rants to the Dean of Engineering in a self-destructive, unfiltered tirade spiked with valid points: "He cursed a thin-skinned and entitled student body ... He cursed the sushi flown in for the dining halls and the Tempur-Pedic mattresses in the freshman dorms. He cursed the Board of Trustees, a conspiracy of coal and biotech billionaires who opposed a minimum wage of $15 per hour for the food service staff making hour-long commutes to campus from East St. Louis." And, oh the irony: This man who's lost all rational perspective on appropriate behavior curses the university's "obsession with public relations and image." The Altruists boasts numerous charms, ranging from worthy ethical issues treated with an effective wryness to its rare, fond celebration of steamy St. Louis. Its ending is well-earned, and so are its life lessons, adding up to an unusually promising debut.